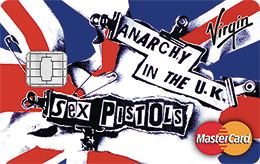 So Virgin are offering these ‘punk’ credit cards. I own you. Don’t forget. 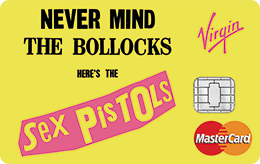 … As they take out their credit card to fund their plastic life and remain in debt to the wealthy bankers who are laughing down their Hugo Boss sleeves. Probably. It’s almost like a great rock n roll swindle. In grad school I was a teaching assistant for an undergraduate “History of Rock ‘n’ Roll” class. The professor discouraged discussion, so all these teenagers just quietly, dutifully took notes on the music of rebellion. Bonkers.